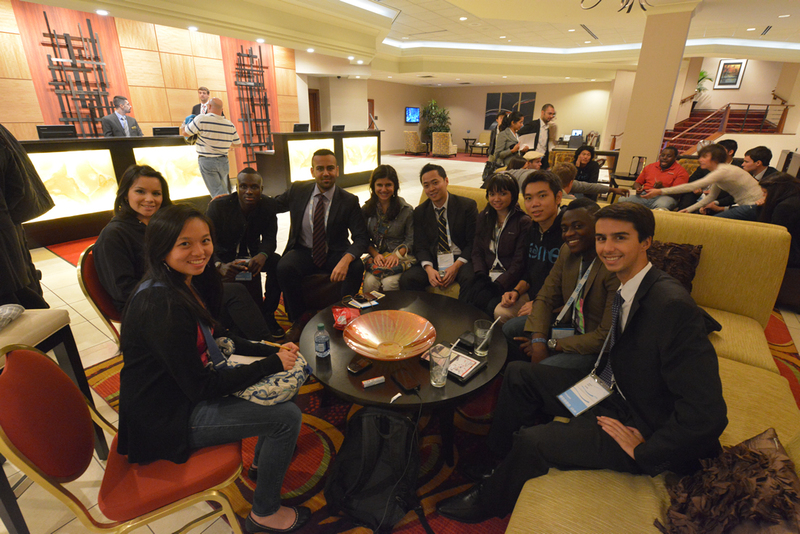 Even after more than twelve hours of intense discussion and debate at the David Lawrence Convention Center, the One Young World delegates did not take rest in their efforts to make a difference. After hours, behind the scenes, masses of delegates have organized their own “Night Owl Sessions” on pressing issues and initiatives of their own choosing. At the Marriot hotel lobby in downtown Pittsburgh, beginning at 9 p.m., one such discussion was entitled “Being a Tri-Sector Athlete.” The session was coordinated and conducted by Harvey Lam, a Canadian Delegate and the General Counsel for the Tri-Sector Forum. The focus of the discussion was the emerging tri-sector model of leadership that focuses on integrating government, business, and non-profit sectors to make more effective and well-rounded leaders. The Tri-Sector Forum’s website explains that “society’s most complex and pressing issues increasingly require the three sectors to collaborate to achieve sustainable outcomes.” Tri-Sector Forum is involved with the White House, the global management consulting firm McKinsey and Company, and Harvard University to implement these ideas. The focus of the Tri-Sector Forum is to mold new leaders with the tri-sector mindset, and encourage current decision makers to implement the tri-sector model within their leadership role. Lam started the discussion by telling the stories of situations that bring the three sectors of government, business, and non-profit together. He gave the example of Coca-Cola, who trained the Tanzanian government to deliver medicine in rural areas. Coca-Cola came to the realization that if beverages could be delivered to these destitute regions, medicine also could reach them. In this way, a private sector company had the experience to make a genuine social difference. Lam also gave the example of when governments have to come to a compromise between non-profits and businesses as an example of all three sectors collaboration towards a solution. The group collectively described successful leaders who initially began their careers in one of the three sectors — business, government, or non-profit — yet eventually integrated the sectors to amplify their impact. Lam believes in the Einstein quote that says “chance always favors a prepared mind” and hopes to educate people about the importance of tri-sector leadership so they can implement it for themselves. However, the discussion wasn’t just about commenting on the idea of tri-sector leadership. Many of the delegates are examples of tri-sector leadership themselves. A returning delegate and true tri-sector athlete, ambassador from Canada Shaaz Nasir,has worked in the government sector with the Government of Canada, the non-profit sector with the North South Institute, and in the private sector with Shopify. Nasir emphasized that many leaders recognize that all three of these areas are vital, yet they don’t know how to integrate given their different backgrounds. He used his experiences of jumping from one sector to another to emphasize his point that professionals within each sector may think differently, yet they all have the same ultimate goals. Another delegate from Canada, Gabrielle Scrimshaw’s passion is in the non-profit initiative called the First Nations Group, which advocates for the indigenous in Canada who suffer from a large lack of support. She thinks the main word that comes to mind when discussing the issues of today is “complex,” yet she believes that emphasis on tri-sector leadership will simplify the problems to make the most impact. Her personal strategy is to “succeed in private sector, and then go into the public with an established network.” Scrimshaw strongly emphasized that doing, not theorizing, is the best way to gain experience. In this way she stressed that tri-sector leaders have the necessary experience in all these three vital areas to be the most successful leaders of the day. Michel Chikwanine was another fascinating member of the session. A delegate from Canada, but born in the Democratic Republic of the Congo, he emphasized the importance of educating high school students about tri-sector leadership. He stressed that a lot of high school students dream of entering a very specific vocation, like a medicine or a law. These young people must understand that in order to lead a wholesome life, and have a wholesome experience in their field, they must have the skills in all three sectors, he said. Chikwanine suggested that the group bring tri-sector leadership classes to high school. Lam responded that in terms of education the Tri-Sector Forum has started a course at Harvard University combining the Harvard School of Business and Harvard Kennedy School of Government, training students to be the tri-sector leaders of tomorrow. The Night Owl Session entitled “Being a Tri-Sector Athlete” truly showed that One Young World delegates will not just talk the talk, but walk the walk. The delegates are truly innovative thinkers by strategizing and implementing methods like tri-sector leadership to create the best possible future for the global community.